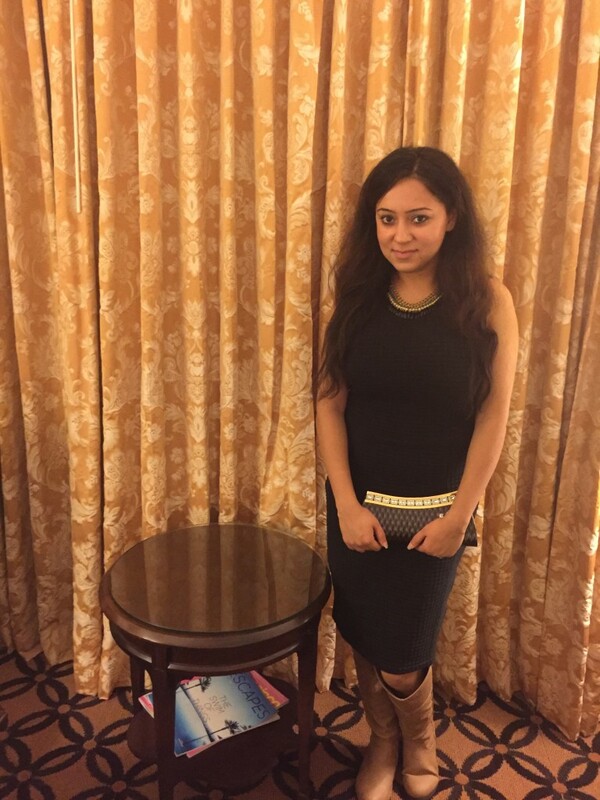 Tons Of Clothes Yet Nothing To Wear Crisis – Emerald Cuff To The Rescue! I bet many of us have our closet full of clothes but still nothing to wear. Do you ever feel that way? Well I have for years but I am getting much better at it. Over the years I have struggled with having too many clothes but still always complaining that I don’t have enough to wear. Ricky points to my overflowing closet every time I crib about not having enough and needing to go shopping before every trip. Let’s just say that it almost became a ritual to go shopping before every trip in our house hold. Then why do I still not have anything to wear? Why do I keep wearing those 15-20 outfits when I have over 50 hanging in my closet? Answer is plain and simple. Impulse buy. Just because it’s on sale or I like the way it looks. Now that is the key point. Do I Like It or Love It? When you really love an item of clothing, you’ll find yourself wearing it over and over. So only buy what you love. Many of us women dream of having different things to wear for everyday of the year and feel we can never have enough. So Imagine my surprise when I decided to change my shopping habits. I went through a lot of clothes that I haven’t worn in last decade and donated them. I still from time to time buy random things but my closet is becoming more and more practical. There is something greatly attractive about a woman who is dressed soft, subtle, ethereal and elegant…ask any guy! 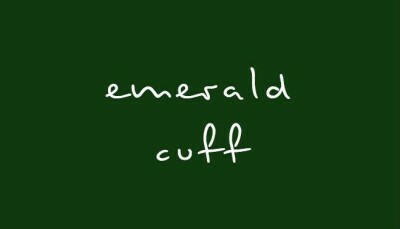 What Is an Ideal Wardrobe & Why I love Emerald cuff? Ideal wardrobe will have 20 really good individual pieces that can be dressed up with accessories for a night out or dressed down for a casual look. Trust me that is all you need. Just 20 pieces. Invest in quality, fit and fabric. It may seem expensive but will last you a long time over something that looks cheap and will lose its shape after couple of washes. Now talking about my love for Emerald cuff! Emerald Cuff makes it simple for busy moms and women to look their best. Need I say more? How Emerald Cuff Came To The Rescue? I am in SFO right now and attended a very important corporate event last night that I was invited to by Ricky’s office here in SF. Dress code was business casual. So one had to be classy, sophisticated and yet not too formal. For the first time I didn’t have to dig too deep in my closet and this Westmont Quilted Dress was a perfect pick! If you are a loyal reader then you have read me rave about this dress in my earlier post already! If you are new then please read the earlier post. This dress is a perfect example of how you can take something from casual dress down look to corporate ready. I remembered my very first conversation with Erin from Emerald cuff when she mentioned that she loved this dress as well and this is one of her favorite pieces due to its versatility. So imagine my joy when I got an opportunity to collaborate with Emerald cuff again this month and review this deep plum tunic & white biker skinny jeans for them. Dressed for a casual dinner with Ricky for Friday night in SFO! *Took above jeans picture from their website to show the fit. This white biker Jeans is a flattering wardrobe staple and a steal at $15 right now. Tunic is a relaxed fit with woven v-neck, partial buttoned placket and shirttail hem complete with shoulder detail and functional button cuffs. Finished with pleated detailing at the back. This wardrobe essential is an ideal match for the season’s slim pants and leggings. 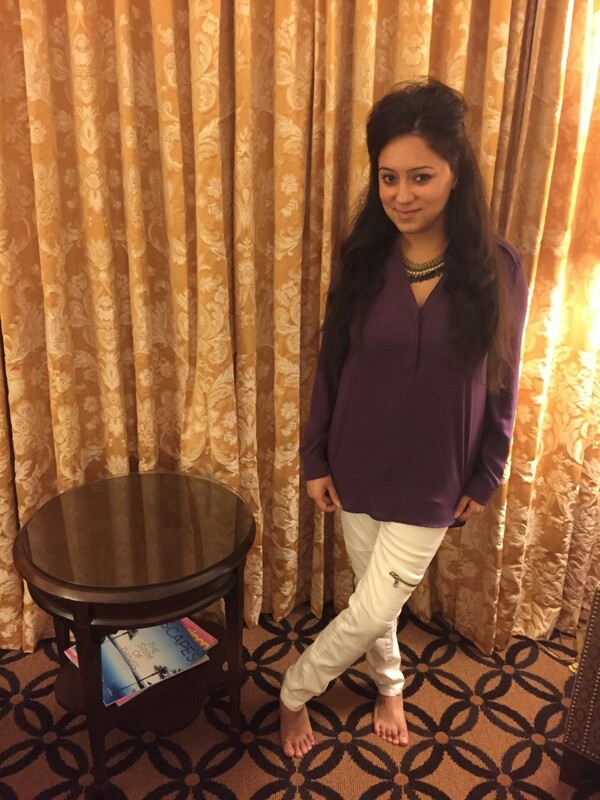 The fabric is really high quality and looks more elegant then my similar Zara tunic! Their hand-picked fashion collections are released monthly in limited numbers. They are the hard to find gems that women seek – beautiful, versatile, easy to wear apparel and artisan jewelry. “The founders, Erin D., Maria, and Erin O. hand-pick fashion collections that are released monthly in limited numbers and always have the modern on-the-go woman in mind. You can pick individual pieces or buy the collection. You can start re-building your ideal wardrobe now! Begin to discard anything that does not fall under elegant and fun category and start shopping for elegant, classic yet fun pieces. I had never heard of Emerald cuff. Very beautiful pieces! My favorite are those white leggings. OBSESSED with those white pants! I need to check this website out!! !